AEC provides first class voyage performance involving all kinds of Drybulk cargoes with a young fleet above 1,000,000 mts Deadweight ranging from 32,000 dwat to 74,000 dwat. The average fleet vessel size is 45,300 dwat. AEC’s are first class performers and have close relationships with a wide range of ship owners worldwide. 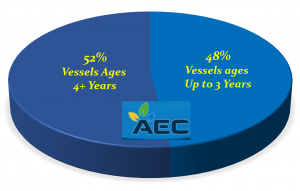 AEC charters vessels on a repeat basis from well respected companies such as Pacific Basin, K-line, NYK, NS United, Polsteam Shipping, Precious Shipping, Bunge, Bohandymar (Bocimar), CTM and ADM.
AEC will review the Charter Party and in turn authorize Owners Broker (or the sole broker) to sign the Charter Party on their behalf. When the original Charter Party has been signed by/on behalf of both parties, the broker will e-mail the fully executed Charter Party (PDF form) to AEC (Chartering@AECarrriers.com ) for their files. The broker retains the original fully executed Charter Party in their files. AEC is covered for P & I, CLH and FD & D and are members of Steamship Mutual. AEC is in possession of valid SCAC Code, via NMFTA, as well as valid Carrier Bond, via Shoreline Mutual (Bermuda) Ltd, all required for U.S. Trading. We are also AMS in all U.S. ports represented by T. Parker Host of Maryland Inc. to enter and transit manifest data via the U.S. TRACS system. We are proud members of Marine Money with whom we enjoy a close relationship. On the 1st of August 2011 AEC partnered with Dataloy Systems for shipping software and hardware services. AEC will have access to Dataloy’s shipping systems through a fully online service with an innovative physical hardware setup which meets all of AEC’s needs. In turn, Dataloy will be utilizing AEC’s extensive industry knowledge to further develop and improve their systems.